1.1 Now the teachings of yoga begin. 1.2 Yoga is the restriction of the flux of consciousness. 1.3 Then the seer stands in his own form. 1.4 At other times, there is conformity with this flux. 1.5 This flux is fivefold ; afflicted or non–afflicted. 1.6 They are : valid cognition, misconception, conceptualization, sleep and memory. 1.7 Valid cognition is based on perception, inference and testimony. 1.8 Misconception is false knowledge not based on the appearance of its object. 1.9 Conceptualization is without perceivable object, following verbal knowledge. 1.10 Sleep is a fluctuation resting on the thought of non–occurrence. 1.11 Remembering is not being deprived of the experienced object. 1.12 Restrict this flux through practice and dispassion. 1.13 Practice is the effort to gain stability in that restriction. 1.14 This is firmly grounded only when cultivated properly and for a long time uninterruptedly. 1.15 Dispassion is the smart volition of one without thirst for sensate and revealed objects. 1.16 Superior to that is non–thirsting for the strata of Nature resulting from the vision of purusa. 1.17 Seeded union is called ‘cognitive’ by being connected with cogitation, reflection, joy and I–am–ness. 1.18 The other (seedless union) has a residuum of reactors and follows the former when the thought of cessation is practiced. 1.19 The union of those who have merged with Nature and those who are bodiless is due to their focus on the thought of becoming. 1.20 Seedless union is preceded by faith, energy, mindfulness, (seeded) union and supra–cognition. 1.21 This is near to him who is extremely vehement in yoga. 1.22 Because this can be modest, medium or excessive, the result differs. 1.23 Or union through devotion to the Lord. 1.24 The Lord is a special purusa untouched by the causes of sorrow, karma and its fruition and the deposit in the depth–memory. 1.25 In Him the seed of all–knowing is unsurpassed. 1.26 He was also the mentor of the ancients by virtue of His temporal non–boundedness. 1.27 His word is OM. 1.28 Recite it to realize its meaning. 1.29 Hence the attainment of inwardmindedness and also the disappearance of the get betweens. 1.30 Sickness, idleness, doubt, carelessness, sloth, lack of detachment, false vision, non–attaining the stages (of yoga) and instability are the distractions of consciousness ; these are the obstacles. 1.31 Pain, depression, tremor of the limbs, wrong inhalation and exhalation jointly become with the distractions. 1.32 Counteract these by practice on a single object. 1.33 To show friendliness, compassion, gladness and equanimity –be they joyful, sorrowful, meritorious or demeritorious– pacifies consciousness. 1.34 Or through controlled expulsion and retention of breath. 1.35 Or it comes about when a heightened sensoric activity has arisen holding the mind steady. 1.36 Or by the sorrowless and illuminating. 1.37 Or when consciousness is directed to those who conquered attachment. 1.38 Or when resting on knowledge arising from dream and sleep. 1.39 Or through contemplation as desired. 1.40 His mastery extends from the most minute to the greatest magnitude. 1.41 And when fluctuations have dwindled, consciousness is like a transparent jewel ; there results with reference to the ‘grasper’, ‘grasping’ and the ‘grasped’ a coincidence with that on which consciousness abides and by which it is ‘anointed’. 1.42 So long there is conceptual knowledge based on the meaning of words, the state is called ‘coincidence mixed with cogitation’, or conceptual union. 1.43 When the depth–memory is purified, as it were empty of its essence and the object alone is shining forth, the state is empty of cogitations, or non–cogitative union. 1.44 Thus by these forms the other two types of union, subtle and ultra–subtle are explained ; they use subtle objects. 1.45 And the subtle objects terminate in the undifferentiate. 1.46 These forms of coincidence (cogitative, non–cogitative, subtle and ultra–subtle) verily are with seed. 1.47 When there is a autumnal brightness in ultra–subtle union, the state is the clarity of the inner being. 1.48 In this state of lucidity, insight is truth–bearing. 1.49 The scope of this differs from that gained from what one heard and inferred ; this owing to its particular purposiveness. 1.50 The reactor born from that binds all others. 1.51 When also this is restricted, owing to the restriction of all, seedless union ensues. 2.1 Ascesis, self–study and devotion to Īshvara constitute the yoga of action. 2.2 This yoga aims at cultivating union and attenuating the causes of sorrow. 2.3 Nescience, I–am–ness, attachment, aversion, the will–to–live are the five causes of sorrow. 2.4 Nescience is the field of the other causes ; they can be dormant, weak, intermittent or aroused. 2.5 Nescience is the seeing of the eternal, pure, joyful and the ātman in the ephemeral, impure, sorrowful and in what is not ātman. 2.6 I–am–ness is the identification as it were of the seer and the capacity of seeing. 2.7 Attachment rests upon pleasant experiences. 2.8 Aversion rests opon sorrowful experiences. 2.9 Thus the will–to–live, flowing along by its own inclination, is rooted even in the sages. 2.10 The subtle form of these (causes of affliction, namely the reactors and thoughts during union), has to be overcome by the process of (spiritual) counter–flow. 2.11 The crude form of these causes of sorrow are to be left behind by contemplation. 2.12 The causes of sorrow are the root of the action–deposit and this may be experienced in this or in future lives. 2.13 So long as the root exist, there is fruition from it in the form of birth, a span of life and enjoyment. 2.14 These have delight or distress as results, according to the meritorious or demeritorous causes. 2.15 Because of the sorrow present in the transformation of Nature, in its anguish, in its reactors and due to the conflict between the movements of Nature, to the discerner all is merely sorrow. 2.16 What is to be abandoned is the sorrow yet to come. 2.17 The correlation made between the seer and the seen is the cause of what is to be overcome. 2.18 The seen has the character of brightness, activity and inertia ; is embodied in elements and sense–organs and serves the purpose of enjoyment and emancipation. 2.19 The strata of Nature are : the particularized, unparticularized, differentiate and undifferentiate. 2.20 The seer is sheer seeing, but though pure, sees the mind (and its thoughts). 2.21 The essence of the seen is only for the sake of this seer. 2.22 Although the seen has ceased to exist for he who has accomplished his purpose, it has nevertheless not ceased to exist, since it is a common experience to all others. 2.23 The correlation allows to apprehend the own form of the power of the owner and of the owned. 2.24 The cause of this is ignorance. 2.25 When this disappears, the correlation ceases ; this is cessation, the aloneness of seeing. 2.26 The means of cessation is the unceasing vision of discernment. 2.27 For he who possesses this there arises, in the last stage, prajñā, which is sevenfold. 2.28 Through the performance of the members of yoga and with the dwindling of impurity, the radiance of true knowledge comes about, up to the vision of discernment. 2.29 Restraints, observances, posture, breath–control, sense–withdrawal, concentration, contemplation and union are the eight. 2.30 Non–harming, truthfulness, non–stealing, chastity and greedlessness are the restraints. 2.31 Valid in all spheres, irrespective of birth, place, time and circumstance are these. They are the great vow. 2.32 Purity, contentment, austerity, self–study and devotion to the Lord are the observances. 2.33 For the repelling of unwholesome thoughts cultivate their opposites. 2.34 Thoughts such as harming etc., whether done, caused to be done or approved, whether arising from greed, anger or delusion, whether modest, medium or excessive – these find their unending fruition in nescience and sorrow ; so cultivate their opposites. 2.35 When grounded in non–harming, all enmity is abandoned in one's presence. 2.36 When grounded in truthfulness, one masters action and its fruition. 2.37 When grounded in non–stealing, all jewels appear. 2.38 When grounded in chastity, vitality is obtained. 2.39 When settled in greedlessness one secures knowledge of the whys and wherefores of one's births. 2.40 Purity gives a distance towards one's limbs and the desire of non–defilement by others. 2.41 Furthermore, also purity of beingness, gladness, one–pointedness, mastery of the sense–organs and the capability of seeing one's ātman are achieved. 2.42 Through contentment unexcelled joy is gained. 2.43 Through austerity, as impurity dwindles, power over body and sense–organs. 2.44 Through self–study, contact with the chosen deity. 2.45 Through devotion to the Lord, union. 2.46 Posture is steady and comfortable. 2.47 This is accompanied by the relaxation of tension and the coinciding with the endless. 2.48 Hence, the pairs of opposites are unable to strike. 2.49 When this is achieved, breath–control (the cutting off of the flow of inhalation and exhalation) should be practised. 2.50 Breath–control is external, internal and fixed in its flux, it is regulated by place, time and number, it can be protracted or contracted. 2.51 Transcending the external and the internal sphere is called ‘the fourth’. 2.52 Then, the covering of the light (of knowledge) disappears. 2.53 And the mind is fit for concentration. 2.54 Sense–withdrawal occurs when the senses disunite from their respective sense organs, corresponding to the own form of consciousness. 2.55 Hence the supreme obedience of the sense–organs. 3.1 Concentration is the binding of consciousness to a single spot. 3.2 Here, the one–directionality of the thoughts related to the object of concentration is contemplation. 3.3 That, shining forth as the object of concentration –as it were empty of its own form– is union. 3.4 The three together are constraint. 3.5 Through mastery of that prajñā flashes forth. 3.6 Its progression is gradual. 3.7 Compared with the previous members these three are inner. 3.8 Yet in relation to seeded union they are outer members. 3.9 The restriction–transformation connected with consciousness in its moment of restriction is the subjugation of the reactors of emergence and the outgoing of that of restriction. 3.10 The calm flow of this is effected through reactors. 3.11 Union–transformation is the dwindling of all–objectness and the uprising of one–pointedness. 3.12 Then, when the quiescent and the uprisen thoughts are similar, the one–pointedness–transformation of consciousness occurs. 3.13 By this are explained the transformations of form, time–variation and condition with regard to the elements and the sense–organs. 3.14 The form–bearer is that which follows the quiescent, the uprisen or the indeterminable. 3.15 The cause of the difference in the transformations is the differences in the sequence. 3.16 Through constraint on the three forms of transformation comes knowledge of past and future. 3.17 The sound, the object and the thought are superimposed on one another in a confused way. Through constraint on the distinction of these, there arises knowledge of the sounds of all living beings. 3.18 Through a perception of the reactors, knowledge of previous births. 3.19 Through the thoughts of another, knowledge of his consciousness. 3.20 But not of the object suporting this, for it is absent from it. 3.21 Through constraint on the form of the body, upon the suspension of the capacity to be perceived, meaning the disruption of the light travelling from that body to the eye, invisibility. 3.22 Karma is acute or deferred. Through constraint thereon, or from omens, knowledge of the time of death. 3.23 Through constraint on friendliness etc., the powers of that quality. 3.24 Through constraint on the power of the elephant etc., the strength of it. 3.25 By focusing the light of cognition on any object, knowledge of its subtle, concealed and distant aspects. 3.26 Through constraint on the Sun, knowledge of the world. 3.27 Through constraint on the Moon, knowledge of the arrangement of the stars. 3.28 Through constraint on the pole–star, knowledge of their movement. 3.29 Through constraint on the navel wheel, knowledge of the organization of the body. 3.30 Through constraint on the throat wheel, the cessation of hunger and thirst. 3.31 Through constraint on the tortoise channel, steadiness. 3.32 Through constraint on the light in the head, vision of the perfected ones. 3.33 Or in a flash–of–illumination all is known. 3.34 Through constraint on the heart, understanding of consciousness. 3.35 Experience is a thought based on the non–distinction between absolutely unblended purusa and beingness. Knowledge of purusa comes from constraint on the own–purpose of purusa, apart from the other–purposiveness of Nature. 3.36. Hence, a flash–of–illumination in hearing, sensing, sight, taste and smell. 3.37 These are obstacles to union, but attainments in the waking–state. 3.38 Consciousness can enter another's body on relaxation of the cause of attachment and through the experience of going forth. 3.39 Through mastery of the up–breath, one gains the power of non–adhesion to water, mud and thorns and levitation. 3.40 Through mastery of the mid–breath one acquires effulgence. 3.41 Through constraint on the relation between ear and ether, the Divine ear. 3.42 Through constraint on the relation between body and ether and through the coincidence with light objects such as cotton, the power of traversing the ether. 3.43 An external, non–imaginary state of mind is the ‘great incorporeal’ from which comes the dwindling of the coverings of the (inner) light. 3.44 Through constraint on the coarse, the own form, the subtle, the connectedness and the purposiveness of objects, mastery over the elements. 3.45 Hence, the manifestation of powers such as atomisation etc., the perfection of the body and the indestructibility of its constituents. 3.46 Beauty, gracefulness and adamant robustness are the perfection of the body. 3.47 Through constraint on the process of perception, the own–form, I–am–ness, connectedness and purposiveness, mastery over the senses. 3.48 Hence, speed of mind lacking sense–organs and mastery over the matrix of Nature. 3.49 For he who has merely the vision of discernment between purusa and beingness the supremacy over all states and omniscience ensues. 3.50 Through dispassion even to that, with the dwindling of the seed of the defects, aloneness. 3.51 The invitation of the high–placed gives no cause of attachment or pride, because the renewed and undesired inclination can once again manifest. 3.52 Through constraint on the moment and its sequence, knowledge born of discernment. 3.53 Hence the awareness of the difference between similars which cannot normally be distinguished due to the continuity of the distinctions of class, appearance and position. 3.54 The knowledge born of discernment is a liberator and is omni–objective, omni–temporal and non–sequential. 3.55 Thus, with the equality in purity of the sattva and purusa, aloneness. 4.1 The powers are the result of birth, herbs, mantra, ascesis or union. 4.2 The transformation into another category of existence is possible because Nature is superabundant. 4.3 The cause–without–measure does not create Nature but –as a farmer– singles–out possibilities. 4.4 Individualized consciousness proceeds from the primary I–am–ness. 4.5 These individualized consciousnesses are engaged in distinct activities, but the one consciousness is the originator of the others. 4.6 Of these individualized consciousnesses, that born out of contemplation is without subliminal deposit. 4.7 The karma of the yogi is neither black or white ; that of the others is threefold. 4.8 Thence follows the manifestation only of those subliminal traits corresponding to its fruition. 4.9 On account of the uniformity between the depth–memory and the subliminal activators there is a causal relation, even though separated in terms of place, time and birth. 4.10 These are without beginning because of the perpetuity of the primordial will. 4.11 Because of the connection (of subliminal traits) with cause, fruit, substratum and support, it follows that with the disappearance of these, the disappearance of those is brought about. 4.12 Past and future as such exist, because of the difference in the paths of the forms. 4.13 These are manifest or subtle and composed of the gunas. 4.14 The ‘that–ness’ of an object derives from the homogeneity in the transformation. 4.15 In view of the multiplicity of consciousness as opposed to the singleness of an object, both belong to separate levels. 4.16An object is not dependent on a single consciousness. If so, what would happen to it when not perceived (by that mind) ? 4.17 An object is known or not by reason of the required coloration of consciousness by it. 4.18 Because of the immutability of purusa, the fluctuations of consciousness are always known by its superior. 4.19 That fluctuating consciousness has no self–luminosity because of its seenness. 4.20 And so it is impossible to cognise both consciousness and its object simultaneously. 4.21 If consciousness were perceived by another this would lead to a regress from cognition to cognition, confusing memory. 4.22 When the unchanging awareness assumes the shape of that consciousness, experience of one's own cognitions becomes possible. 4.23 Provided consciousness is coloured by the seer and the seen, it can perceive any object. 4.24 That consciousness, though speckled with countless subliminal traits, has its own other–purpose due to (being limited to) its collaborate activity. 4.25 For him who sees the distinction, there comes about the discontinuation of the cultivation of the false self–sense. is borne onwards towards aloneness. 4.27 In the intervals of that consciousness, other thoughts may arise from the reactors. 4.28 Their cessation is achieved in the same way as described for the causes of sorrow. 4.29 Always non–usurious even in that consciousness and through the vision of discernment, a union designated as ‘cloud of Dharma’ ensues. 4.30 Hence the discontinuation of the causes of sorrow and of karma. 4.31 Then, when all coverings of imperfection are removed, little remains to be known because of the infinity of knowledge. 4.32 Hence the termination of the sequences in the transformation of the gunas, whose purpose is fulfilled. 4.33 ‘Sequence’ means that which is correlative to the moment, apprehensible at the terminal point of a transformation. 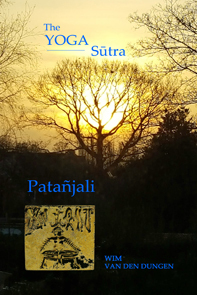 4.34 The process–of–evolution of the gunas, devoid of the purpose for purusa, is aloneness, the establishment of the power of awareness in its own form. End. With thanks to Yogi Nick Evans who was so kind and generous to share his chanting of the Yoga-Sûtra. 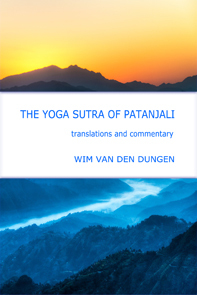 The chanting of the book is preceded by an invocation and ends with a short prayer.